Feb 4 (AZINS) Leaders of several opposition parties petitioned the Election Commission on Monday and demanded that 50 per cent of EVM results should be cross-checked with voter verifiable paper audit trails (VVPATs) before declaring final Lok Sabha election results. Leaders of 23 political parties met Chief Election Commissioner Sunil Arora and Election Commissioner Ashok Lavasa, seeking redressal of the issue of alleged tampering of electronic voting machines (EVMs) before Lok Sabha polls.The leaders told the Election Commission the people of the country doubted the efficacy of EVMs and this issue needs to be redressed.The Election Commission said it has heard the concerns of the parties on their demands related to the counting of VVPAT slips and assured them that the issues raised would be "deliberated and examined". "While considering the averments made by the political parties, the Commission shall also keep in view the pronouncements made by the different courts as well as the report expected shortly from the Indian Statistical Institute on the subject, besides the overall administrative and operational feasibility on the ground, before firming up any response," the EC said in a statement.The opposition parties had earlier sought moving back to the ballot paper system, but after the Election Commission categorically ruled it out, they changed their strategy and are now demanding matching of results of 50 per cent EVMs with VVPATs. "We are writing to you in most trying times. The times when each and every institution built and strengthened over decades, for safeguarding democracy and the rule of law, is sought to be subverted by those who have scant respect for people's will. "In these trying and testing times, we are writing to you as members of an exalted constitutional institution, tasked with the responsibility of ensuring free and fair elections, which in turn is the bedrock of democracy and has repeatedly been held to be part of the unamendable basic structure of the Indian Constitution," according to a memorandum signed by leaders of all 23 parties, including Congress president Rahul Gandhi and NCP supremo Sharad Pawar, to the poll panel. The memorandum also said if the difference of votes bagged by the winner and his nearest rival is less than 5 per cent, "mandatory counting of paper trail from VVPAT should be carried out in each polling station...If there is a difference in counting of votes between EVM and VVPAT, then the result in counting from VVPAT should prevail." 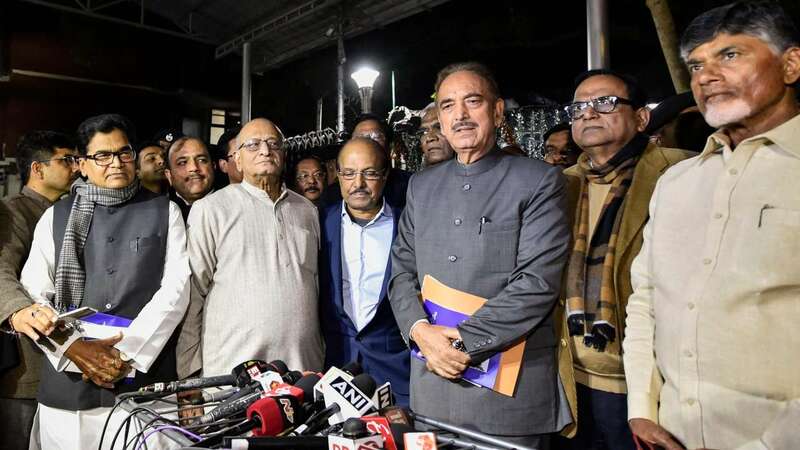 The leaders of various opposition parties earlier met in Parliament and discussed their strategy on the issue.After the meeting, Leader of Opposition in Rajya Sabha Ghulam Nabi Azad said, "If a vote polled for one party goes to another party, it is against democracy." Azad told reporters that the parties have demanded that the EC removes the "shortcomings" in EVMs. He said parties wanted to revert to the old paper ballot system, but parties decided that since there is no time left for Lok Sabha polls, they have demanded bringing in transparency in the EVM system. "We have demanded thatbe it Lok Sabha or assembly elections, 50 per cent votes be matched with paper trail of votes and the EC should not destroy the results of VVPAT machines," he said.Andhra Chief minister N Chandrababu Naidu said 23 parties representing 69 per cent of the voters have met the EC. "Even now they are counting only 1 per cent (of VVPAT). We have demanded total transparency. Even developed countries are using ballot papers. But since there is no time we have demanded that 50 per cent VVPAT slips be counted. For democracy, for creating confidence, they can do that job. Since everybody is having a doubt it is the duty of the Election Commission to convince people that it is undoubtable," he said. "The EC has a mandate and power as per the Constitution to conduct free and fair elections and people should have confidence in EVMs and electoral system. EC must restore the credibility of EVMs," CPI leader D Raja said. "The onerous task of redeeming the pride and prestige of the entire electoral process in the world's largest democracy is bestowed upon you and we appeal to your conscience and act and do right so that the future of this country and of our democracy is secure. "We hope and trust that you will receive these suggestions in the spirit of nation building in which they have been made and that you will act expeditiously and decisively to implement them," the memorandum said.The delegation included Ghulam Nabi Azad, Mallikarjun Kharge, Ahmed Patel and Anand Sharma of the Congress, Chandrababu Naidu (TDP), Majid Memon (NCP), Derek O'Brien (Trinamool Congress), Ramgopal Yadav (SP), Satish Chandra Misra (BSP), Omar Abdullah (NC), Mohd Salim and T K Rangarajan (CPI-M), Manoj Jha (RJD), Sanjay Singh (AAP), D Raja (CPI), Danish Ali (JD-S), N K Premchandran (RSP), Badruddin Ajmal (AIUDF) and K G Kenye (NPF).